Same can be said about home versions as well. Been there, done that. 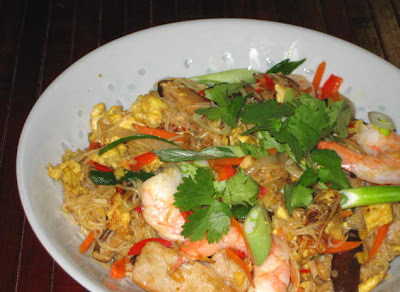 I have no problem with taste, heat or oiliness, my problem is the vermicelli. It took some serious Googling and testing to come up with technique that works and that is repeatable. The secret is the soaking time in hot water. Less then 10 minutes and vermicelli will fragment into little pieces, longer then 15 and they will be mushy. Overcooking is another no-no. One can’t forget that food keeps cooking even when removed from heat. Ingredients are as varied as there are cooks that prepare it. 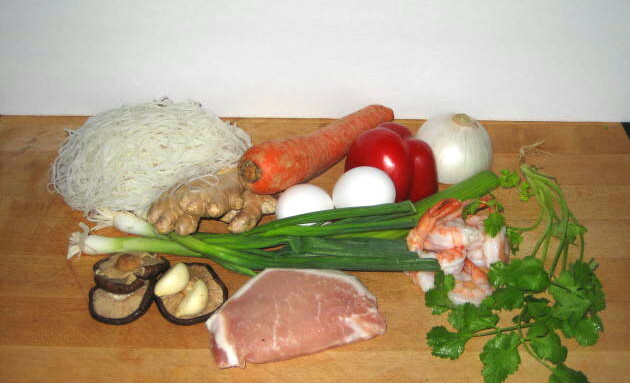 Besides vermicelli, curry and oil there are only 2 other ingredients that appear in all recipes: egg and garlic. Everything else is optional be it vegetarian or with meat and/or seafood. Give it a try. 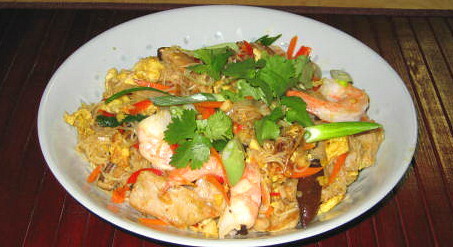 § Soak vermicelli in hot water for 15 minutes prior to cooking. Drain, separate strands, sprinkle with sesame oil, toss and set aside. § Combine the pork and shrimp in the same bowl and add the soy sauce, fish sauce, rice wine, and the corn starch. Mix together thoroughly and let it marinade for at least 10 minutes. § Add little vegetable oil to the already hot wok. Add the pork and shrimp with as little of the marinade as possible and cook for a minute or two. When everything is more or less cooked, add the marinade, continue to cook for a few seconds more and then remove the pork and shrimp from the wok. Remove to bowl and wipe the wok clean. § Add a little bit more oil to the wok and drop in the onions, cooking them for a half minute or so. Next, add the red pepper, garlic, ginger, spring onions, bean sprouts or Napa cabbage and any other vegetable you are using, and stir. Stir fry together briefly and remove from the heat. Remove vegetables to the bowl with pork and shrimps and keep warm. § Separate the strands of vermicelli once more. Again, add a smidge of oil to the hot wok. Add the eggs, let them set and stir briskly to scramble them. Add the noodles and stir. Next, combine the curry powder, sugar and season with salt and pepper and combine with eggs and vermicelli. Toss till well combined. § Finally, add the vegetables, the shrimps and pork to the wok. Toss everything together, cooking just enough to blend the flavors and heat everything through. If vermicelli are still hard add a little bit of stock or water and toss. § Place on individual preheated plates, garnish and serve.